Imagine how upset you’d be if your roommate harnessed you to a massive human slingshot on a boat in the middle of a lake, pulled the quick release on a rope (that ended up ripping your scrotum) then posted it on YouTube. You might hate the guy, but only if he wasn’t making every other day of your life the most exciting one yet. Meet Creighton Baird, the leader of a growing cabal of young, Mormon adventure junkies, based mostly in Utah, who are rigging up dangerously fun stunts that look like they’re straight out of video games. To wit: They throw 40-person glowstick parties in dark caves that require a 60-foot rappel to enter. They rig 500-foot ziplines from the tops of canyons to double-decker houseboats below and drop into rivers on snow skis. They even have pirate-themed paintball wars between rival ships in the Salt Flats and play human Duck Hunt with giant catapults. They might seem like a bunch of trust fund kids on a perpetual spring break—several do live rent-free in a six-bedroom, 11,000-square-foot house in Provo with a 12-foot movie screen, two saunas, two steam rooms and an 80-foot zipline over the outdoor pool—but some are building highly profitable businesses by playing as hard as gravity allows. Baird has done all of the logistics and setup for 10 videos by Devin SuperTramp, a Youtube movie sensation who went viral in February 2012 with an arousing video of kids freefalling on a 150-foot rope swing from Moab’s Corona Arch. They’ve been hired by Hershey’s, Nitro Circus, The Travel Channel, Ford and even Mountain Dew to execute wild commercials in the great outdoors. Baird has locked down sponsorships with Vooray clothing and Reebok to fund the gear and production costs for their bizarre stunts. It appears to be working. Production companies from all over the world are trying to get on Creighton Baird’s schedule, which is booked for the next year. So are private groups with big money who want to play out the stuff they see on shows like Thrillbilly and Nitro Circus with their colleagues and friends. Japanese and Norwegian tourist groups have paid Creighton thousands of dollars to set up private weekend camps with epic zip lines and rope swings and waterfall rappels. Creighton only started rock climbing four years ago, but he’s been able to pull off this lunatic-for-hire type of tourism that’s emerging as people watch more extreme dirtbag videos and boost their expectations for adventure guides. But while everything Baird does is fun and inspiring—he’s the kind of guy whose Instagram account makes you cry at your desk—it’s certainly not safe. The scrotum fiasco really happened in July. 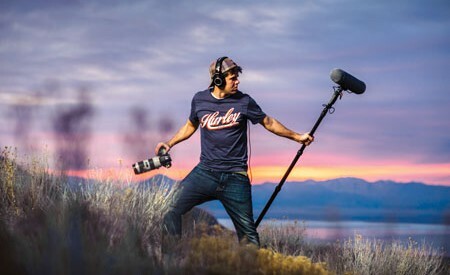 In February, he rigged a 400-foot pendulum rope swing in a south Utah canyon while SuperTramp shot a stomach-dropping film with an Opticopter. Baird’s girlfriend of three and a half years, Jess, hesitated in her harness for an hour and a half before Baird stroked her hair, told her he loved her, then pushed her off the cliff as she screamed into the drop, “I’M BREAKING UP WITH YOUUUUUU!” That outtake has rivaled the actual video with over 10 million views and made the news rounds on TV stations as far as Germany. “I quickly became as un-dateable as Chris Brown,” Baird says. Other paricipants’ casual carnage includes broken ribs, legs and one of their engineer friends getting knocked unconscious in the middle of a lake, all from miscalculations or botched landings while shooting these internet shenanigans. Baird himself has broken his neck, leg, toes, fingers, and spent two-and-a-half consecutive years on crutches. He has more sore spots on his body than a stunt man, but does that really qualify him as safe? Aside from some redundant checklists and always volunteering to go first on anything he rigs (sometimes resorting to Rock, Paper, Scissors), faith is another big factor in the risks that Baird and his crew undertake. A growing number of daredevils in the action sports world, especially those related to Gregg Godfrey and his Nitro Circus gang of highflying daredevils and wheelchair backflippers, are highly devout Mormons with an uncanny lack of fear when it comes to throwing themselves off bridges and 50-foot skate ramps. Nitro Circus athlete Erik Roner, who grew up Mormon but isn’t so devout, has noticed this ethereal invincibility. “Some of them are fresh off their missions and they have a lot of faith and belief in God [as their protector] and just go for it,” he says. Baird likens this kind of evangelical thinking to that of Ferdinand Magellan, the 16th century Spanish explorer and devout Christian who boldly pioneered the New World in pursuit of the Indonesian Spice Route. Magellan repeatedly led his men into death-wish battles against unconquerably large native armies under the belief that God would not let them die. “That worked three or four times until he felt like he was Superman,” says Baird, “Then they went to battle some natives of an island near The Philippines and they were all murdered and he was decapitated with his body put on a spit on the beach somewhere.” Though historical accounts differ slightly, the point remains—God does not make you invincible. While not the strictest of practicing Mormons, he does maintain a spiritual awareness in his daily life. “Creighton gets much more spiritual enlightenment being outside, enjoying what God has created for us than he does sitting in church,” says Johnny “Bubba” Quintana, Creighton’s longtime friend and sidekick who once shoved a straightjacketed and goggle-less Baird in a padlocked dog kennel to the bottom of a 12-foot pool and timed his escape attempt, which failed miserably. When all is said and done, these adventures aren’t a challenge to religious faith—they’re a celebration of it. Two years ago, Creighton Baird, Devin SuperTramp, et al. were just a group of rowdy BYU kids trying to get their kicks by going big and skirting danger while bonding with their closest friends. They’re still doing the same thing, but money just found a way in and enabled them to pursue their madcap passions every day. To some, that’s worth the occasional broken neck or torn scrotum. This is the stunt that got Supertramp on the viral hotseat. In an old storm drain under Interstate 80 in Salt Lake City, they dam up the water with old road signs and logs before letting the flows surge down the ¼-mile-long metal tube, riding kayaks, floatie rafts, and boogie boards out the other end. SuperTramp went through holding a Canon 5D Mark III without a water housing. With 80 paintball guns—including one paintball bazooka firing 80 rounds per shot—and 400,000 paintballs, as well as Jeeps, ATV’s, dirt bikes, a $600,000 dune buggy launching jumps and paramotor operating from the sky, they made a video of the most epic videogame-like Capture The Flag scene you could fathom and recreated the Iwo Jima flag-planting photo at the end. Good fun with friends from your church group. They have plans to bolt a highline on either side of South Provo’s Bridal Veil Falls—a 607-foot double cataract waterfall used for ice climbing in the winter. They’ll launch over the top section of the falls on an inflatable dolphin and drop into yet another giant rope swing suspended from the line. Creighton Baird and Devin SuperTramp will be traveling across the country this month (September) in a Mountain Dew tour bus to make fan-inspired videos alongside anyone who has the faith to join them.